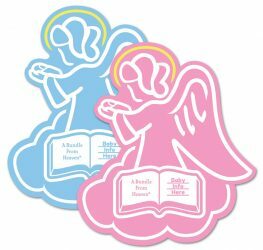 A Bundle From Heaven® – Guardian Angel Birth Announcement Signs! THE PERFECT WAY TO CELEBRATE A BIRTH! A Bundle From Heaven® offers quality inspirational birth announcement signs to celebrate the arrival of newborns. Our founding belief that “Babies are a precious gift from GOD” lead to the creation of our trademark Guardian Angel birth announcement signs which offer proud new parents a great way to share the good news while celebrating the birth of their child! Personalize your one-sided, lightweight Guardian Angel sign in minutes with the newborn’s name, weight, birth date or even a photo to memorialize the momentous life event! 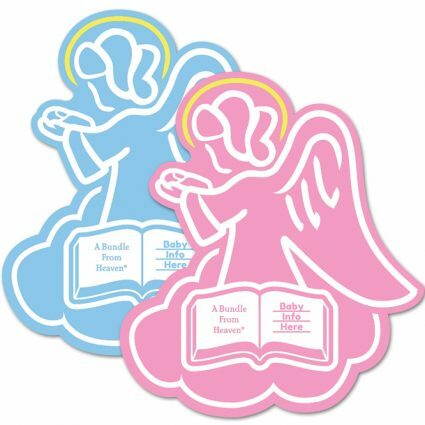 Available in blue or pink and standing a convenient 16 inches tall for portability, your Guardian Angel can serve as a birth announcement, baby shower gift, or even as a gender reveal, and is a perfect way to make the occasion extra special! We absolutely LOVE our angel!! It’s perfect! My family surprised us with one of your angels and we couldn’t be happier! THANK YOU!!! I gifted one of your angels to my sister-in-law for her baby shower…EVERYONE loved it and asked where to get them. SENDING CUSTOMERS YOUR WAY!! ©Copyright 1991-2016, A Bundle From Heaven®, ABFH™. All Rights Reserved.